We’d love your help. Let us know what’s wrong with this preview of God's Big Picture by Vaughan Roberts. Sixty-six books, forty authors, written over nearly 2,000 years, in two languages and several different genres. A worldwide best-seller published in countless sizes and bindings, translations and languages. It has been sworn by in court, fought over by religious people, and quoted in arguments. The Bible is clearly no ordinary book. How can we begin to read and understand Sixty-six books, forty authors, written over nearly 2,000 years, in two languages and several different genres. A worldwide best-seller published in countless sizes and bindings, translations and languages. It has been sworn by in court, fought over by religious people, and quoted in arguments. The Bible is clearly no ordinary book. How can we begin to read and understand it as a whole? To ask other readers questions about God's Big Picture, please sign up. When I was younger and I first began to read the Bible in earnest, I learned to read passages in little chunks, deconstructing each sentence so that I could fully understand the meaning of each word in its context before moving on to the next bit. I would sometimes spend days meditating on a particular verse, especially if it presented a list of virtues to consider (e.g. Galatians 5:22-23). I would dedicate a day to each virtue, meditating on how I could cultivate each of these virtues in my lif When I was younger and I first began to read the Bible in earnest, I learned to read passages in little chunks, deconstructing each sentence so that I could fully understand the meaning of each word in its context before moving on to the next bit. I would sometimes spend days meditating on a particular verse, especially if it presented a list of virtues to consider (e.g. Galatians 5:22-23). I would dedicate a day to each virtue, meditating on how I could cultivate each of these virtues in my life. So having to read this book all in one shot for a class was... different from my usual experience with Scripture, to say the least. The premise of this book is that the Bible is one unified story, and the main character is Jesus Christ. Even though we aren't formally introduced to Him until the Gospel of Matthew, everything up to that point foreshadows Him and points to Him. I whipped through the book in just over an hour. I then laid in bed and marveled at the big picture of God's Word. This book was an excellent, clearly-written summary of a topic that ought to be too big to be contained in such a small tome. But Roberts did an excellent job of making his point without belaboring it. After reading it, I wanted to know more about how all of creation, from the time of its genesis, was waiting for Jesus to come and redeem it. And, now that we have seen Him revealed, those of us who believe are waiting for Him to return in glory. But, as we wait, we have the Word of God to remind us to wait with joy for what is surely coming. I can't wait to see Jesus with my own eyes. But, until then, I'll see Him in Scripture, described with the loving clarity that only a Father could express. I've just re-read God's Big Picture for the first time in twelve years. I'm really glad I did. In this short little book, Vaughan Roberts gives a wonderful overview of the Bible that helps you to take in the over-arching story of the Bible. What I really like about the book is its clarity and warmth. This is not a technical book, this is a book written to help the ordinary Christian to understand how Exodus fits with Matthew, what on earth is going on in the book of Amos, and how Revelation shoul I've just re-read God's Big Picture for the first time in twelve years. I'm really glad I did. In this short little book, Vaughan Roberts gives a wonderful overview of the Bible that helps you to take in the over-arching story of the Bible. What I really like about the book is its clarity and warmth. This is not a technical book, this is a book written to help the ordinary Christian to understand how Exodus fits with Matthew, what on earth is going on in the book of Amos, and how Revelation should give them hope for the future. Reading it again after twelve years, I'm struck by how foundational this book has been in my own life. Though I had forgotten its pages, God's Big Picture helped me to understand the Bible for myself something I'll be forever grateful for. This was a solid entry level biblical theology. The author is heavily relying on Graeme Goldworthy which is commendable. Some things could have been elaborated on, but the intention of the book was broad in its scope. For an entry level book on biblical theology and understanding how the bible relates as a whole to God's redemptive history, I highly recommend to the new Christian, new member, youth, or anyone new to understanding the bible as a whole. I think most of my church should read this as This was a solid entry level biblical theology. The author is heavily relying on Graeme Goldworthy which is commendable. Some things could have been elaborated on, but the intention of the book was broad in its scope. I think most of my church should read this as a starter. An excellent book for discipling others to see the big, single story of the Scriptures and how Christ is at the center of it all. An excellent overview of the major themes of Scripture. In one book he seamlessly summarizes what I've learned and read in bits and pieces over the last few years. A good, basic overview of the biblical storyline from the perspective of God’s kingdom. It will be a useful resource for those new to the faith or beginning to look at the larger narrative of Scripture for the first time. First read in 2014-ish. Re-read this in 2018. Good overview of Bible storyline. A bit redundant if you’ve already read your fair share of theology books but definitely a go-to to put in the hands of a new believer. Comprehensive yet concise. 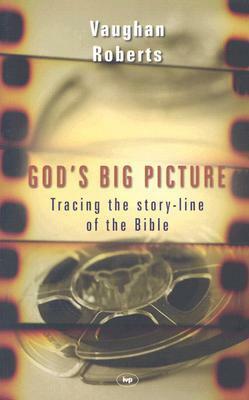 In God's Big Picture, Vaughan Roberts covers the story of the Bible from Genesis to Revelation in 150 pages. Roberts does an excellent job of covering the Old Testament especially explaining the prophetical books. If you're looking to quickly skim the surface of the storyline of Scripture, or desire a basic introduction of the Bible as a whole, then this the book for you. This is a good, solid introduction to a redemptive-historical reading of the whole Bible. Often, liberals tend to dismiss Scripture as irrelevant for our modern day except maybe for a few of Jesus' moral teachings. In reaction, conservatives tend to mine the Bible for quotes and boil it down to distill doctrines to shoot down the liberal's misuse and abuse of Scripture. While there is a way to do this properly, in such pursuits it can often be forgotten that the Bible is not a systematic theolog This is a good, solid introduction to a redemptive-historical reading of the whole Bible. Often, liberals tend to dismiss Scripture as irrelevant for our modern day except maybe for a few of Jesus' moral teachings. In reaction, conservatives tend to mine the Bible for quotes and boil it down to distill doctrines to shoot down the liberal's misuse and abuse of Scripture. While there is a way to do this properly, in such pursuits it can often be forgotten that the Bible is not a systematic theology or philosophy book or even a moral guide, though, as I said, rightly understood, it does all these things too. If the Bible is taken on its own terms, we see it is, above all, the story of what God is doing in history first to create and then, after humanity's rebellion, to redeem and renew the world and bring it back into submission to him and harmony within. This book is an accessible introduction to understanding the Bible as one coherent story. In writing this book, Robert's has done a masterful job of distilling Goldsworthy's lengthier writings that can intimidate many would-be readers. While I don't agree with all of his eschatology ("end-times" or last things, he is amillenial whereas I am post millenial and believe that Christ triumphs over the gates of hell through the church), this is still valuable for the discerning reader who is as yet unfamiliar with viewing the Bible as a single story of redemptive history. Vaughan Roberts presents to us a clear Biblical Theology that is faithful to God's Word. He finds Scriptural backing for all the ideas he shares (he claims that most are not original and are based on Goldsworthy's "Christ-Centred Biblical Theology"). He shows the connection between the Old Testament and New Testament - how the Old Testament covenants and promises look forward to their fulfilment in Jesus Christ. This is a must-read book for anyone seeking to read the Bible and to listen to each Vaughan Roberts presents to us a clear Biblical Theology that is faithful to God's Word. He finds Scriptural backing for all the ideas he shares (he claims that most are not original and are based on Goldsworthy's "Christ-Centred Biblical Theology"). He shows the connection between the Old Testament and New Testament - how the Old Testament covenants and promises look forward to their fulfilment in Jesus Christ. This is a must-read book for anyone seeking to read the Bible and to listen to each underlying message from Creation till Consummation. He suggests that the big theme of the Bible is the "kingdom of God" and builds on that idea throughout, giving a consistent and understandable presentation of God's big picture of redemptive history. Two lessons can be drawn: reading the Bible has a horizontal historical dimension - in terms of the promises God makes and their fulfilment. It also has a vertical relational dimension - where as human beings we respond to God through His self-revelation through His Word and also from the lives of the characters we encounter. With roots in covenantal theology, lately I find myself so much more often thinking (and speaking to my kids) in terms of God's kingdom as that idea has such hands-on imagery that is much easier to take hold of when the boots are on the ground (...probably why Jesus spoke that way most often himself). This book takes a kingdom-view approach to the Bible from 30,000 feet up to see what God has done in his kingdom and his story. What a help the big picture is to see! I have just studied single boo With roots in covenantal theology, lately I find myself so much more often thinking (and speaking to my kids) in terms of God's kingdom as that idea has such hands-on imagery that is much easier to take hold of when the boots are on the ground (...probably why Jesus spoke that way most often himself). This book takes a kingdom-view approach to the Bible from 30,000 feet up to see what God has done in his kingdom and his story. What a help the big picture is to see! I have just studied single books/topics for my whole Christian life and (after reading this, realize I) apparently adopted a bit of the "don't see the forest for the trees" myopia. This book gives me a new set of glasses for my spiritual eyes. Nothing wrong with single book studies, of course, trees make up the forest, but to see the whole of God's "big picture," is soul strengthening and faith affirming. Highly recommend it. The book and optional bible study take a brief redemptive-historical trace through the Bible and would be great for new Christians or those new to redemptive-historical reading of Scripture. Or foggy eyed "old" Christians too. A great entry level summary of 'Biblical Theology' - examining the Bible as a single unified story. The definitive books are by Graeme Goldsworthy (Gospel & Kingdom, According to Plan), but Roberts has written a much more accessible book, while explicitly crediting Goldsworthy. Ideal for small group study -- there are discussion questions after every chapter. Fr. Roberts provides a thematic exploration of the Bible from Genesis to Revelation. This book is a good choice for a Bible study group; however, the one I would recommend, if one wants to learn about the major themes of the Bible as one proceeds through the various books, is The Kingdom of God by John Bright. This was such a helpful and refreshing book, overall, for someone who has been a Christian for many years. It is easy to "miss the forest through the trees" while reading books in the Bible and this book helps draw it all together like a strand of pearls. It is a beautiful picture--praise God! Really concise, simple, clear overview of the big picture of the Bible. A well constructed, easy to read book thats a must have for those new to the christian faith. this book will put historys best seller in perspective. Context is king. That is a great point to keep in mind when reading anything. The context that something is written in is crucial to a good understanding of what is written. This is especially true of the Bible. To acknowledge the context of a passage is critical to not misunderstanding and misapplying the passage being studied. Most heresies and popular misunderstandings of Scripture owe their existence to poor exegesis, particularly in this area. As a professor I had would always say, "A text Context is king. That is a great point to keep in mind when reading anything. The context that something is written in is crucial to a good understanding of what is written. This is especially true of the Bible. To acknowledge the context of a passage is critical to not misunderstanding and misapplying the passage being studied. Most heresies and popular misunderstandings of Scripture owe their existence to poor exegesis, particularly in this area. As a professor I had would always say, "A text out of context is a pretext!" And he is quite right. It is incredibly important to see the immediate context of a statement. What are the surrounding sentences and paragraphs addressing? It is equally important to see the context of the document as a whole. Who is the author addressing? What is his stated/implied purpose? Sometimes we will forget to take into account the greater context of the author and the document. The cultural context of the author and the time period the document was composed in are both crucially important to the proper understanding of a document. All of these factors, even when addressed, will still leave us wanting for a proper understanding of Scripture if we do not address the fact that God's revelation is not a hodgepodge collection of randomness, but rather an unfolding of truth from Genesis to Revelation. If we do not see the passage in its proper context within the Canon of Scripture, we can easily miss key points and misunderstand the passage, the book, or even the entirety of Scripture. Scholars have debated for years whether or not it is possible to point to a unifying theme that binds the whole Bible together. Many have argued that the search for such a theme is fruitless: it is better just to accept that Scripture contains a number of different threads and then look at them individually without trying to unite them. They warn of the danger of squeezing all parts of the Bible into a mould rather than letting them speak individually in their rich variety. That is an important warning that must be heard. Any unifying theme that is used to help us to see how the Bible fits together must arise out of Scripture itself, rather than being imposed upon it; and it must be broad enough to allow each part to make its own distinct contribution. The theme of the kingdom of God satisfies both requirements. God’s kingdom was the dominant theme in Jesus’ teaching. He began his public ministry by proclaiming, ‘The time has come...The kingdom of God is near’ (Mark 1:15). He taught that his mission was to introduce the kingdom in fulfilment of the prophecies of the Old Testament. The kingdom of God can be defined as ‘God’s people in God’s place under God’s rule’ (Figure 5). 2 That may sound like an overly simplistic definition for such a significant theme in Scripture, but the simple words contain great depth. God longs for human beings to enjoy an intimate relationship with him in his presence. As he is a perfect, holy God, that is possible only as we submit to his loving rule and do not sin. That is life at its best; life as it was designed to be lived. To live under God’s rule means to enjoy God’s blessing; the two go together. That is what we see at the creation in the garden of Eden until the fall. But then human beings disobey God and forgo his blessing. The consequences are devastating not just for humanity but for the whole creation; everything is spoilt. But in his great love God promises to put things right again and re-establish his kingdom on earth. The rest of the Bible tells the story of the fulfilment of that promise: partially in Israel’s history in the Old Testament period, and then perfectly through Jesus Christ. So the Bible is about God’s plan of salvation: his promise to restore his kingdom, and then the fulfilment of that promise through his Son Jesus. While the Bible is diverse and dynamic, it is not disunified. While there are many voices found in the pages of Scripture, there is one voice that speaks throughout. While there are many subjects covered in Scripture, there is one subject that is above all and found throughout. While there are many people recorded in the pages of these 66 books, there is one person that this Book is actually about. To see that the Bible is about a king and his kingdom, about The King and His Kingdom, is imperative to understanding the whos, whys and whats of Scripture. Robert's book is a tremendous introduction to this topic. It is best seen in how he interprets Scripture in light of the theme of Kingdom. 1. The pattern of the kingdom. In the garden of Eden we see the world as God designed it to be. God’s people, Adam and Eve, live in God’s place, the garden, under his rule as they submit to his word. And to be under God’s rule in the Bible is always to enjoy his blessing; it is the best way to live. God’s original creation shows us a model of his kingdom as it was meant to be. 2. The perished kingdom. Sadly, Adam and Eve think life would be better if they lived independently of God. The results are disastrous. They are no longer God’s people. They turn away from him and he responds by turning away from them. They are no longer in God’s place; he banishes them from the garden. And they are not under God’s rule, so they do not enjoy his blessing. Instead, they face his curse and are under his judgment. The situation is very gloomy. But God, in his great love, is determined to restore his kingdom. 3. The promised kingdom. God calls Abraham and makes some unconditional promises to him: through Abraham’s descendants he will re-establish his kingdom. They will be his people, living in his land and enjoying his blessing, and through them all peoples on earth will be blessed. That promise is the gospel. It is partially fulfilled in the history of Israel,but is only finally fulfilled through Jesus Christ. 4. The partial kingdom. The Bible records how God’s promises to Abraham are partially fulfilled in the history of Israel. Through the exodus from Egypt, God makes Abraham’s descendants his very own people. At Mount Sinai he gives them his law so that they might live under his rule and enjoy his blessing, as Adam and Eve had done before they sinned. The blessing is marked chiefly by God’s presence with his people in the tabernacle. Under Joshua they enter the land and, by the time of Kings David and Solomon, they enjoy peace and prosperity there. That was the high point of the history of Israel. They were God’s people in God’s place, the land of Canaan, under God’s rule and therefore enjoying his blessing. But the promises to Abraham had still not been completely fulfilled. The problem was sin, the continual disobedience of the people of Israel. That was soon to lead to the dismantling of the partial kingdom as Israel fell apart. 5. The prophesied kingdom. After the death of King Solomon civil war broke out and the kingdom of Israel split into two parts: Israel in the north and Judah in the south. Neither was strong. After 200 years of separate existence, the northern kingdom of Israel was destroyed by the Assyrians. The southern kingdom struggled on for another century, but then it too was conquered and its inhabitants were taken into exile in Babylon. During this depressing period in their history God spoke to the people of Israel and Judah through some prophets. He explained that they were being punished for their sin but still offered hope for the future. The prophets pointed forward to a time when God would act decisively through his King, the Messiah, to fulfil all his promises. The people of Judah must have thought that that time had come when they were allowed to return from exile, but God made it clear that the great time of salvation was still in the future. That is where the Old Testament ends: waiting for God’s King to appear to introduce his kingdom. 6. The present kingdom. Four hundred years passed after the completion of the Old Testament before Jesus began his public ministry with the words, ‘The time has come...The kingdom of God is near’ (Mark 1:15). The waiting was over; God’s king had come to establish God’s kingdom. His life, teaching and miracles all proved that he was who he said he was: God himself in human form. He had the power to put everything right again, and he chose a very surprising way of doing it: by dying in weakness on a cross. It was by his death that Jesus dealt with the problem of sin and made it possible for human beings to come back into relationship with his Father. The resurrection proved the success of Jesus’ rescue mission on the cross and announced that there is hope for our world. Those who trust in Christ can look forward to eternal life with him. 7. The proclaimed kingdom. By his death and resurrection Jesus did all that was necessary to put everything right again and completely restore God’s kingdom. But he did not finish the job when he was first on earth. He ascended into heaven and made it clear that there would be a delay before he returned. The delay is to enable more people to hear about the good news of Christ so they can put their trust in him and be ready for him when he comes. We live during this period, which the Bible calls ‘the last days’. It began on the Day of Pentecost when God sent the Spirit to equip his church to tell the whole world about Christ. 8. The perfected kingdom. One day Christ will return. There will be a great division. His enemies will be separated from his presence in hell, but his people will join him in a perfect new creation. Then at last the gospel promises will be completely fulfilled. The book of Revelation describes a fully restored kingdom: God’s people, Christians from all nations, in God’s place, the new creation (heaven), under God’s rule and therefore enjoying his blessing. And nothing can spoil this happy ending. It is no fairy story; they really will all live happily ever after. Is the Old Testament even relevant anymore? If yes, how does it fit into the narrative of the New Testament? What is the purpose of those "old-fashioned" laws? Is the evil God of the Old Testament really the same as the gracious and kind God of the New Testament? In this book, Roberts traces the story line of the Bible right from the Old Testament (i.e. Genesis, Deuteronomy, 1 Kings) to the gospels and finally, ending at Revelation. He shows readers through careful reading and analyses of the tex Is the Old Testament even relevant anymore? If yes, how does it fit into the narrative of the New Testament? What is the purpose of those "old-fashioned" laws? Is the evil God of the Old Testament really the same as the gracious and kind God of the New Testament? In this book, Roberts traces the story line of the Bible right from the Old Testament (i.e. Genesis, Deuteronomy, 1 Kings) to the gospels and finally, ending at Revelation. He shows readers through careful reading and analyses of the text how each point of Scripture points to Jesus Christ, the centre piece of the narrative of the 66 books often referred to as the Bible. In doing so, he implicitly answers the usual objections and questions raised concerning the Old Testament (see above paragraph). I appreciated how simple this book was. Not only is it less than 200 pages and written in a simple and concise manner, Roberts also helpfully names each chapter with easy-to-remember titles, helping readers solidify the Bible's chronology in their minds. The edition I read also had short Bible studies at the end of every chapter to get readers to helpfully think through some relevant passages. This work is a fantastic introduction to Biblical Theology and is suitable for high school students to adults. Seminary students and pastors will also find it stimulating. Drawing heavily on the work of Graeme Goldsworthy, Roberts has made many of his ideas more accessible and in some places even improved upon them. Roberts's biblical breadth is evident but he skillful avoids getting bogged down in details like Goldsworthy sometimes does. In this work the author traces the storyline of the Bible This work is a fantastic introduction to Biblical Theology and is suitable for high school students to adults. Seminary students and pastors will also find it stimulating. In this work the author traces the storyline of the Bible by considering how the scriptures unfold to reveal God's plan for his kingdom. Using Goldsworthy's well known definition of the Kingdom of God as: God's people, in God's place, under God's rule, he then describes how each of these evolve (can I say that word?) as redemptive history unfolds. He makes following this history simple by organizing redemptive history into 8 neat periods. While his argument will be troublesome to dispensationalists, it is not strictly covenantal. As a progressive covenantalist, I took issue with very few interpretative moves. He takes a mild amillennial position at the end. One of the most perplexing questions for people in general, and Christians in particular, is how to read the Bible. Many read the Bible like a telephone directory or a book of quotations, just pulling individual verses out for their particular need or interest, but Vaughan Roberts explains in this concise Bible overview that the Scriptures are “one book written by one author with one main subject.” (16). The goal is to provide a map in your head that gives the Bible’s big picture, so that, where One of the most perplexing questions for people in general, and Christians in particular, is how to read the Bible. Many read the Bible like a telephone directory or a book of quotations, just pulling individual verses out for their particular need or interest, but Vaughan Roberts explains in this concise Bible overview that the Scriptures are “one book written by one author with one main subject.” (16). This is one of the best books I have read explaining the unified theme of the Bible. In Rev. Vaughan Robert's words, "My goal in this book has been to show how the whole Bible points to the Lord Jesus" (p. 163). He has written the book for the layperson, with discussion questions at the end that can be used individually or in a Bible study context. The book follows God's presence in His Kingdom beginning in Genesis and continuing through to Revelation. This is important to understand in order to This is one of the best books I have read explaining the unified theme of the Bible. In Rev. Vaughan Robert's words, "My goal in this book has been to show how the whole Bible points to the Lord Jesus" (p. 163). He has written the book for the layperson, with discussion questions at the end that can be used individually or in a Bible study context. The book follows God's presence in His Kingdom beginning in Genesis and continuing through to Revelation. This is important to understand in order to make sense of the various books and letters in scripture. This was recommended to me at church and it was hugely helpful. Roberts does an excellent job of explaining how all the books and themes and events of the Bible are connected and how they work together to tell the whole story. I've never found such a clear explanation of the reasoning behind the Old Testament laws, the judgements on Israel, or the prophets before - this book gives a concise, clear overview of how all these tie into God's promises to us through Abraham and what they mean. I now fe This was recommended to me at church and it was hugely helpful. Roberts does an excellent job of explaining how all the books and themes and events of the Bible are connected and how they work together to tell the whole story. Roberts succinctly shows the big picture of the Bible in pointing out how the different parts fit together with each other in one unified story, with everything ultimately pointing towards Jesus Christ. It is written in a clear, introductory manner (without being condescending or trite) that seeks to avoid too much theological or technical language. A relatively thin book given what it is trying to cover, it is a helpful introduction to the big picture of the Bible. Vaughan came to faith as he read through Matthew’s Gospel for himself as a teenager. After studying law at Cambridge University and a brief spell doing student ministry in South Africa, he moved to Oxford to study Theology at Wycliffe Hall and has lived in the city ever since. In 1991 he joined the staff of St Ebbe’s Church to lead the student ministry and since 1998 he has been Rector. He is also Vaughan came to faith as he read through Matthew’s Gospel for himself as a teenager. After studying law at Cambridge University and a brief spell doing student ministry in South Africa, he moved to Oxford to study Theology at Wycliffe Hall and has lived in the city ever since. In 1991 he joined the staff of St Ebbe’s Church to lead the student ministry and since 1998 he has been Rector. He is also the Director of the Proclamation Trust, an organisation that encourages and equips Bible teachers. In his spare time Vaughan writes books and plays cricket and golf.